Went on a service call on a Maytag Washer today. Complaint was that the washer was dead. When I got there, I started by verifying the customer’s complaint. Turns out that the washer would, in fact, spin but would not fill with water. No fill with water == no agitate. Now, this is a very different problem from the washer being completely dead. This illustrates an important principle of appliance repair: the first step to problem resolution is problem identification. How you gonna fix the problem if you’re not even identifying the right problem? All you’ll end up doing is fixing the wrong problem! So, with the problem properly identified, I proceeded to troubleshoot the washer. I listened for the soft hum of the water inlet solenoid valves being energized. But all was silent. Time to break out the meter and go fishin’. I figured the problem was gonna be either the pressure switch or the timer. So, I opened the control panel on the washer to commence my scientific inquiry. One problem was immediately apparent: I saw some fuzzy stuff inside the console that, upon closer examination, turned out to be the dearly departed remains of a wayward rodent. All that was left was clumps of hair and parts of a little mouse skeleton. Looking closely at the air tube on the pressure switch, I could see that our deceased mouse friend must’ve gotten bored inside that control panel because he started gnawing on it. I tried to get a picture of it but my less-than-$100, 3.2 mega-pixel Kodak digital camera only allows me to get so close. You can still kinda make it out in the picture, though. Just use your imagination for the rest. Anyway, did some more testing and found that the pressure switch wasn’t getting voltage– that’s a bad timer, slam dunk. Replaced that air tube for good measure, too. Problem solved! 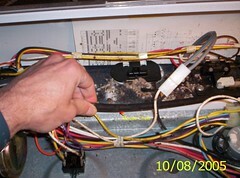 This entry was posted in Washer Repair on October 8, 2005 by Samurai Appliance Repair Man.